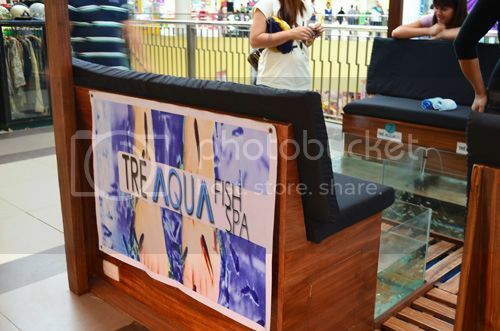 Tre Aqua Fish Spa is at the second level hall of Robinson's Mall in Dumaguete City. 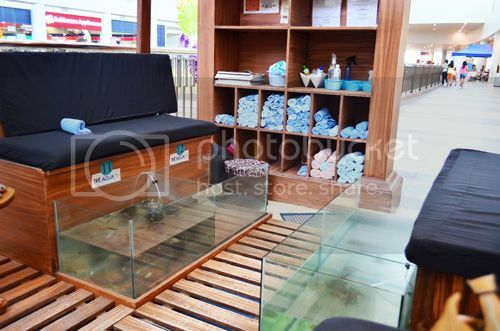 I was shopping for souvenir items then when I accidentally spotted this fish spa, I thought at first it was a mani/pedi bar but I wondered why there were aquariums lining up the floor? So there, spotted - Doctor fishes (Garra rufa) in the tanks. There's always a first time and fortunately, if I may call it that, it's my first fish spa treat. My pink gosh, I closed my eyes as the fishes swarmed my feet, I thought these fishes would let me leave the spa footless - but it was rather a ticklish feel more than little fidgety pinches. 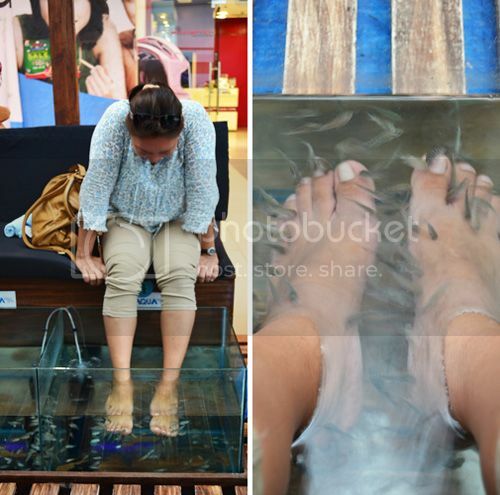 You have to pay P150/15 minutes of letting the fishes nibble on your dead skin. There are also bigger fishes ready at the other tank, probably if you feel you have thicker cuticles then you can opt to drop your feet there, jeje. Anyway, the place is nice and homey, the ladies there were so nice to me, it's also a perfect place for chit-chat with a milk tea drinking buddy while some livings down there fed on your dead cells. I've proven my theory wrong, they didn't whack my feet off, lol, they didn't even finish their food. These fishes aren't meant for curative treatments, but as I said a nice place to chill around with friends in a spa under a mall set-up.